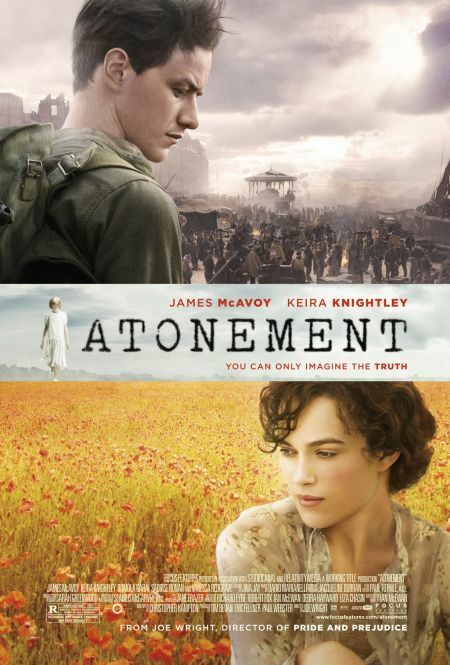 Anthony Lane did an unfavorable review for “Atonement” in this week’s The New Yorker magazine. But there was something about his intro and the few scenes i saw in the trailer that caught my attention, drew me toward the movie. Almost the first sound we hear in Joe Wright ‘Atonement’ is the tap of typewriter keys. Soon, the tapping becomes regular, like drumbeats, and it sets the tempo for the music that comes surging in. Later in the film, it rings out as loudly as gunshots. The implication is clear: words can stir us and set us dancing, but they can also kill. That mysterious double power infused Ian McEwan’s novel, published in 2001, and it lingers in Christopher Hampton’s screenplay, which displays immense ingenuity in facing a basic conundrum: how do you film a story about language and not leave it reeking of books? Based on Anthony Lane’s review and the trailer, it looked like, at least, a well made movie. And I was attracted to the story line and the power of words. So i convinced Gui to go and see it with me. She was skeptical. I wasn’t sure how it would turn out either. We were both pleasantly surprised. Contrary to Anthony Lane’s predicament that this is a movie “with smoke and mirrors” and it has “no heart” (when i read this, i thought, could it be like A Very Long Engagement All shiny surface no inner life?) We were deeply moved by the story. Not sure why Anthony Lane got such a different impression than us. Maybe because he read the book first? Could it mean the book is even better? Now i’m curious. Later Gui commented that it has been a long while since we last saw a good and moving romance movie. Like Anthony Lane pointed out at the beginning, the music of the movie was amazing. The movie has no voice over. But often the music seems to have a life of its own, the music seems to be a character, or a voice over, to emphasize, to elaborate, to hint what is to come, to double back and take a second long look at what had happened, to mourn what is lost, to jump in joy for a love that’s reciprocated. It is such a rich voice, that goes so well with such a rich palette of the English country side, even with a cold morning of French country side during the war. Anthony Lane said he “didn’t believe in Robbie. …didn’t believe in the force of his love for Cecilia, or of hers for him;” Well, he was right, Robbie didn’t believe it either when he met her again in London before he went to war. He said, “we’ve only spent a few minutes in the library three and half years ago!” But she tried to convince him otherwise. And during the war, when he tried getting back to England, with her letters tied together in a neat bundle safely stored inside his shirtpocket, he started to believe in it too. Isn’t that the proof of “the power of words”? For me, what really made this movie great (not just good) was the unexpected yet so powerful an ending. The story touched me throughout the narrative, and i was smitten with the beautiful cinematography and music. But the ending, omg! Speaking of “the power of words”. Such simple sentences, Vanessa Redgrave (as the elderly Briony) delivered them with precision. They are clean and hard, rolled off her tongue, calm, but sharp like a knife. My heart ached, and tears started pouring out as the screen darkened, and cast names started to rise.